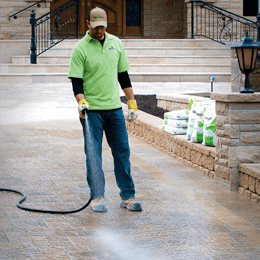 On a properly prepared dry surface (ensure no moisture on the stone surface as this will prematurely begin the activation process) sweep Envirobond into the joints ensuring that the joints are filled to the bottom of the champfer of the paver or 1/8” below the top of the surface of the stone. 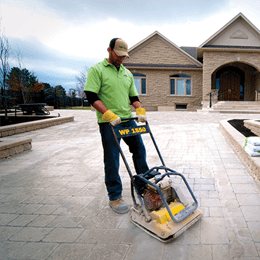 For pavers, compact entire application with a vibrating plate tamper. 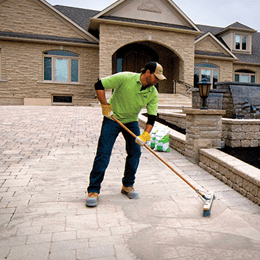 However if using EnviroSTONE on a flagstone surface, use can use a rubber mallet to tamper the sand to the bottom of the joints. It is common after compacting that the aggregate level between the joins drops below an optimal level. Pour and sweep additional product into the joints to bring the levels back up to the desired height. Sweep surface clean. 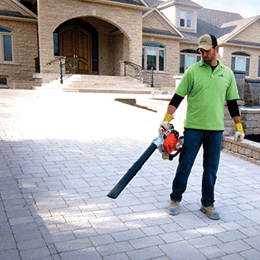 Blow off surface dust with leaf blower or equivalent. Hold leaf blower horizontally approximately 2 feet above the surface on an idle setting to ensure that sand in joints stays in place. With a fine mist spray, saturate the top quarter inch of the joint evenly. This activates the plant glue into a gel which coats the sand particles making it immediately able to resist erosion. Once the surface is activated, let it sit for 5-10 minutes before moving on to stage 6. 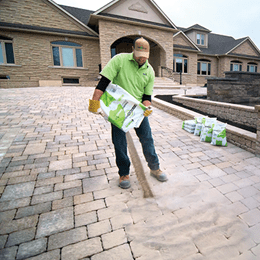 With the surface sand locked into place, use a heavier spray in a side to side motion to clean the paver surface of any remaining residue. This residue wash away in a milk coloured runoff. 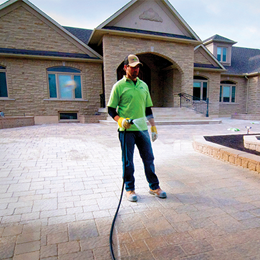 Its important to continue to apply this heavier spray, cleaning the paver surface until the runoff water is evenly clear.